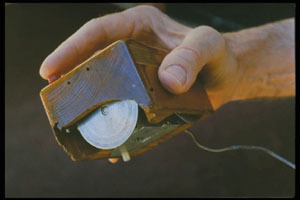 the first computer mouse the public had ever seen, as well as introducing interactive text, video conferencing, teleconferencing, email and hypertext. I mean, Jesus Christ, this is back in 1968, this guy should have temples dedicated to him by now. Engelbart slipped into relative obscurity after 1976 due to various misfortunes and misunderstandings. Several of Engelbart’s best researchers became alienated from him and left his organization for Xerox PARC, in part due to frustration, and in part due to differing views of the future of computing. Engelbart saw the future in timeshare (client/server) computing, which younger programmers rejected in favor of the personal computer. The conflict was both technical and social: Engelbart came from a time in which only timeshare computing was achievable, and also believed in joint effort; the younger programmers came from an era where centralized power was highly suspect, and personal computing was just barely on the horizon. Referred from Engelbart As UberTool? This entry was posted in discussion, links, technology and tagged douglas engelbart, first, mouse, tech by ramblingperfectionist. Bookmark the permalink.